The Wilson Sensation 15L tennis string is supplied as a 12.2m (40ft) set that is enough to re-string one racket. The string has a multifilament core that makes it more arm friendly and incorporates highly elastic nylon fibres that impart power and improve comfort by reducing vibrations. It is available in a natural colour and has a gauge of 15L (1.35mm). for submitting product information about Wilson Sensation 15L Tennis String Set We aim to answer all questions within 2-3 days. 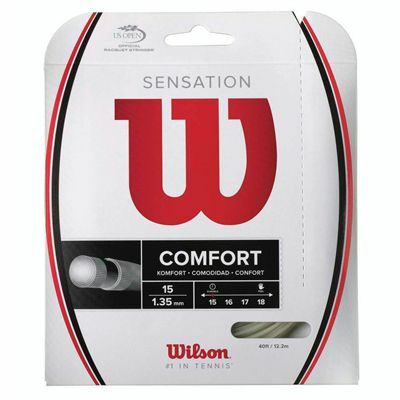 for submitting product information about Wilson Sensation 15L Tennis String Set. We aim to answer all questions within 2-3 days. If you provided your name and email address, we will email you as soon as the answer is published. for submitting product review about Wilson Sensation 15L Tennis String Set.